Hawaii's Hidden Hideaway is an AWARD WINNING Bed and Breakfast. Recipient for two years in a row the MOST ROMANTIC HIDEAWAY AWARD, voted by it's guests. The only B and B from Hawaii to receive this award. Featured in the INN TRAVELER,TOKYO CALENDAR magazines and other international publications. One of the best-kept secrets in Hawaii is this beautiful B and B. Considered the top location on the island of Oahu, in Kailua /Lanikai, this special getaway will make you feel that you are in another world. Hawaii's Hidden Hideaway is ideal for that special occasion, for honeymooners, on business, or families. Located on a quite street. Only a short walk (1 1/2 blocks) to the world famous Lanikai and Kailua Beaches. Watch the sunrise from your deck, listen to the ocean on a quiet night, or walk on the beach as the moon rises between the islands. This distinctive spot is only 30-minutes from Waikiki, Honolulu or the airport. Five minutes from the town of Kailua are great restaurants, antique shops, and rentals for kayaks and windsurfing. Enjoy a private deluxe studio or the suite with an outdoor jacuzzi and partical ocean view. All with private entrances, baths, decks, kitchenettes, free off street parking, cable TV, DVD/CD players, clock radios, phones, ceiling fans, dining area, laundry facilities and much more (units can be adjoining). Chose from king, queen (canopy or brass beds), or twin accommodations. Each unit is stocked with a welcome breakfast of tropical juices, cereals, pastries, yogurt, fruits, coffee, teas, and surprises. Each unit also has a library of activities on the island, restaurant menus, and books on Hawaiian birds and flowers. 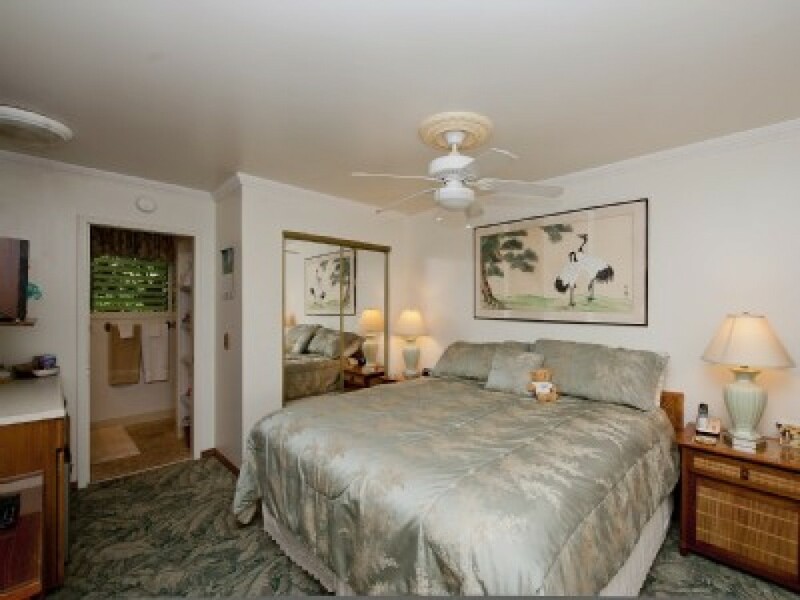 This B&B is filled with “aloha spirit” and has many repeat guests that enjoy the paradise of Hawaii. Minimum stay 3 nights. Deposit required confirming reservation. Member of the Kailua Chamber of Commerce and the Hawaii Better Business Bureau and a licensed establishment. $ Discount rates for long term or multiple units.